Hey, SEG-ers! I’m so excited. This is my first column! EVAR!!! I was brought in to take over the Page Five Ghoul, because the old guy got eaten by a bear or something. Gross. 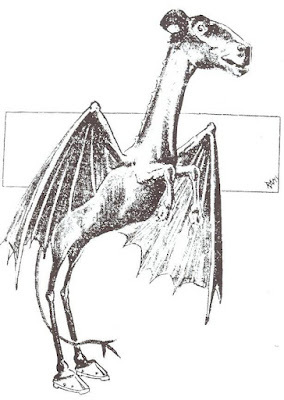 Anyway, Mr. Myrrh sent me to New Jersey to do a report on the Jersey Devil. Not a big hockey fan, so I asked if I could do one instead on nixies. Because faeries vs. devils is a no-brainer, right? But, Mr. Myrrh said I could do one on nixies next week, but I have to do one on the Jersey Devil first. First of all, you don’t know how psyched I was when I found out, this has nothing to do with hockey. It has to do with a woman named Mother Leeds who was pregnant with her thirteenth child. As anyone would do in her situation, she cursed the child in her womb. She gave birth to the child on a stormy night. At first, it seemed like a normal baby, but quickly turned into a hideous, winged beast. It killed a bunch of people and ran off into the woods. And to this day it still walks the Pine Barrens of New Jersey making milk go bad because it doesn’t know how to deal with its pain in a constructive way. The legend says that Mother Leeds was a witch, because people love to throw shade at witches. Have you ever met a witch? They just dance funny and smell like patchouli. I see them at Disco Biscuit shows all the time. The minister at the CYO was always ranting about them, like he was dumped by one. You may be asking: "Is the Jersey Devil real?” I don’t know and I’m not walking in the woods to find out.